We bring forth for Plastic Shoe Covers for our valued clients. These Plastic Shoe Covers are made using quality PVC material, which is acknowledged for its smooth texture and high tearing strength. Plastic Shoe Covers are sterilized, thus can be used in operation theaters. 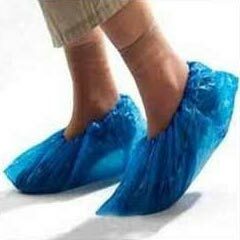 With our range of Plastic Shoe Covers, we are catering demands of many hospitals and nursing homes. Our valued clients can avail Plastic Shoe Covers in different sizes.